Commentluv enabled blogs are easy way to build quality backlinks and drive referral traffic to your blog especially. High quality dofollow backlinks can increase search engine ranking. Commentluv considered as one of the best link building techniques with dofollow backlinks and traffic. 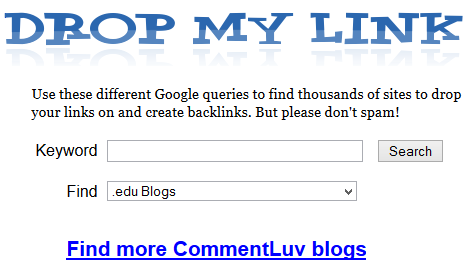 Newbie blogger usually have this question How to find have problem to find CommentLuv Enabled Blogs. It can be tedious task if you don`t know how to do it. So Today I will talk about 3 free online tools which will hep you to get free quality backlinks and traffic. Before that let`s see how this works. Put blog main keywords along with your name. Option of choosing and selecting from 10 recent published posts. You can also see few blogs which want you either share or give plus one with social account to enable the selection. Go to Dropmylink.com and you will see two section one for keywords and second is Find box to select from different types of blog mentioned above, click on search and you will see blogs. So you see, this is very easy to find CommentLuv Enabled Blogs. These tools are amazing and I recommend you to use them. If you have any question, feel free to ask me via comments. Which is your commenting strategy? If you find this post helpful, do share on facebook, twitter and Google plus.